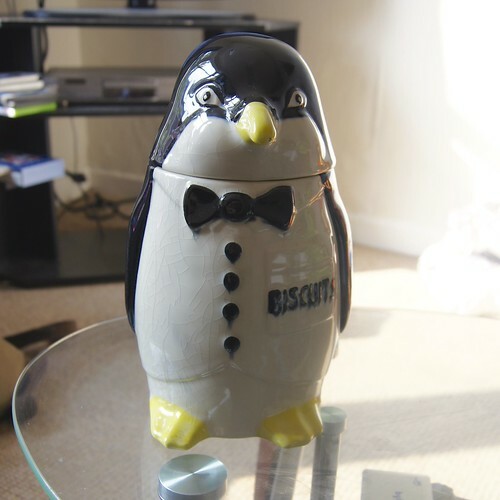 My new biscuit jar. Isn’t he cute? I got him at Vintage Village a couple of weekends ago but didn’t want to show you him until the bf came home off holiday. He reads my blog from time to time so I didn’t want him to see it – I just love showing stuff, it’s half the fun. Anyway, back to Percy. 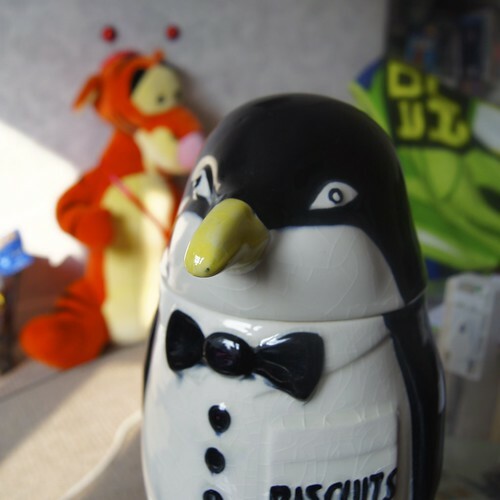 He’s from the 1950s and still has his sealer on him so biscuits stay fresh inside. I couldn’t believe what good condition he was in and even more amazed at the price. £9! Bargainous! Yes that is Tigger in the background wearing deely boppers. 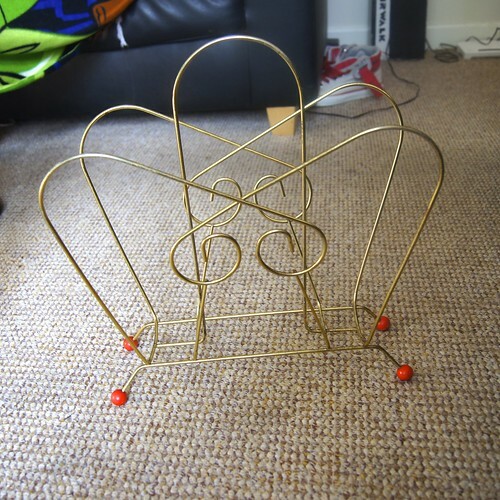 I also managed to find myself an equally bargainous atomic magazine rack. I’ve been wanting one for years! I also bought a beautiful cake stand for my friend’s birthday, but that was it. Very proud of myself for getting sensible things. 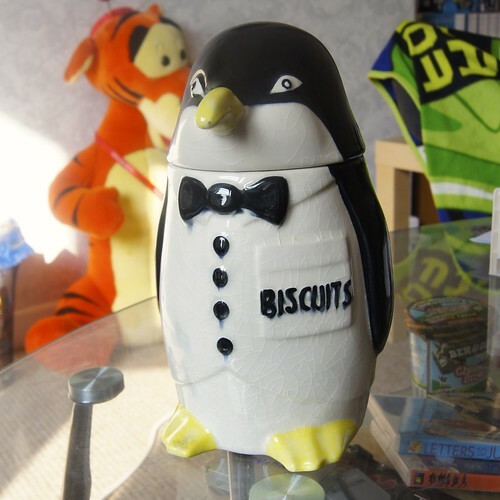 Yes, a penguin biscuit jar is sensible. PS. T-minus 1 day until my epic 5 day weekend! Excite! So today is the day. Moving day. I can’t believe I’ve lived in this house for almost 3 years. That is something of a record for me. Apart from 1 family home in Nottinghamshire, this is the longest I’ve lived in one house. That will make it number 2 out of 20. Yes that’s right, I’ve lived in 20 houses in 24 years. It’s the end of an era. Goodbye teeny room (especially with all my stuff in it!). It is a bit sad and I will miss my friends and the cats but it’s time to move on. I’m going to be living with my bf of 3 years for the first time, along with his current housemate and our equally nerdy friend Claire and her little brother Ant. This is going to be the nerdiest house ever and I can’t wait. Me “Ooh I’ll get to put up my world map and my Marauders Map! As well as living with some awesome people, I get to live in an awesome house. It’s like a tardis – it just keeps going back. I love it. Plus, me and the bf’s room is MASSIVE and we’ll have a bed that you can get in on both sides! (it’s the little things). So the main reason for this post is to say I’m still here, I just won’t be posting as much over the next week as we won’t have internet. Plus I’ll be busy doing my favourite part of moving: Finding places for all of my stuff. P.S I am amazed that all my shoes fit in one box….well, all the shoes I keep in this house anyway, ha ha. A slightly belated top picks this week but I blame the technology gods for this one. In honour of me and my friends finding a house (whoop! 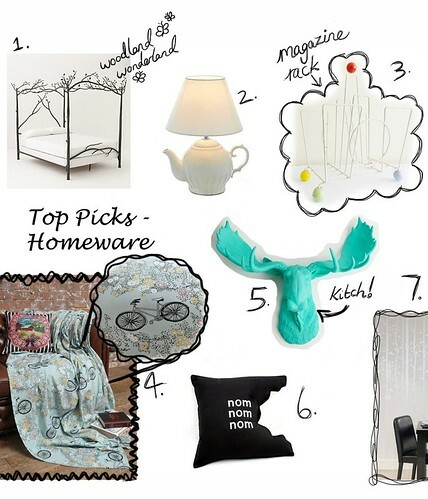 ), I have made this post into a top picks of homeware. I’m so excited. I have loved this style of bed frame for years! Though yes it would be cheaper to cut down a tree and make one yourself out of real wood. But so pretty! Now if someone could please point me in the direction of a lumberjack. I love lamp, I love teapot, therefore I love teapot lamp. I’ve seen a few of these at vintage fairs I’ve been to recently. I just love the little feet! Now I know what you’re thinking. Yes I know, so tacky but it’s got a kitsch charm that I find funny. Plus I could hang necklaces off it! For those of you who don’t think it’s tacky enough – check out the pale pink ones with gold glitter antlers. I shouldn’t admit it but I think they’re pretty awesome too! Me and my friends say this a lot so I think it’s quite fitting. 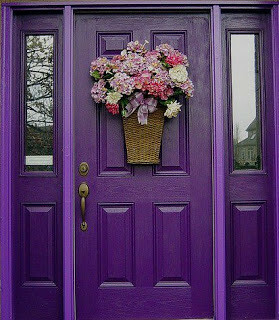 Very subtle, but very pretty. Continues with my pretending I live in a forest theme. Oh lumberjack? Do you like homeware shopping?